As part of Graincorps’ expansion of its’ bulk liquid facilities, BRS Electrical was contracted in conjunction with CommsPower to complete electrical design for a new tank farm and upgrades to an existing fuel terminal at Pinkenba. The system had to monitor tank levels, flow rates, requests for product and transfer product between the ship berth, the new tanks (at 200 Tingira Street) and existing loadout facilities (at 105 Tingira Street). 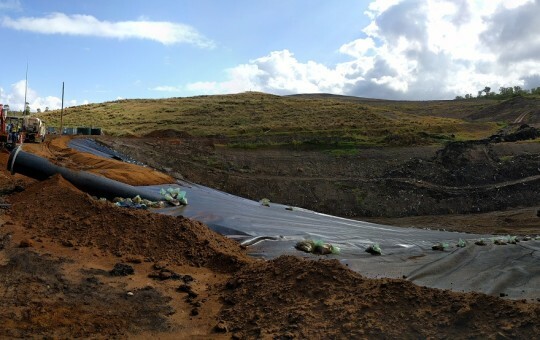 A major consideration for this project was the hazardous area requirements; as half the site had to handle unleaded petrol, much of the design had to comply with AS/NZS60079. This affected lighting, motors/pumps, valves and instrumentation. A final Hazardous Area audit cleared the site for receipt of product. The biggest hurdle for the site, however, was the distance separating the two locations; product and communications had to be linked between the two locations over a distance of 1 kilometre. To overcome this, dual-redundant fibre optic cables were installed between the two sites in underground conduit. The two PLC’s were programmed to operate as independent CPU’s (one on each site) but with data interchanged between the two to facilitate product transfer and emergency shutdown. Finally, CITECT SCADA was set up as a Master/Slave system, to ensure that the SCADA stayed online even if one sites’ server infrastructure failed. To move product between the two sites efficiently, the ITT Pumpsmart system was used. This required communications from the PLC to the master drive, providing the ability to start, stop and monitor the drives as required by the operators. The Pumpsmart system allows smart duty cycling of the drives, to ensure that motors wear at similar rates and that flow rates are maintained at required levels. 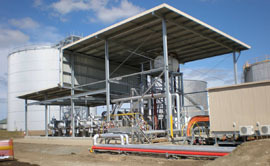 A new innovation for the Graincorp site was the use of Allen Bradley Safety IO. This setup provides a system that self-tests for errors in the emergency shutdown hardware, alerting the user if a fault occurs and safely shutting down both sites to significantly reduce the risk of a catastrophic failure. The Safety IO monitored emergency stop buttons and gas detection hardware. To allow the existing site (105 Tingira Street) to accept the product and new safety protocols, a CPU upgrade was completed within a 96 hour shutdown window. This required CommsPower and BRS Electrical to work together to have the design complete, crosschecked and ready to install in order to minimise issues during changeover. The upgrade was completed without issue and enabled further upgrades. 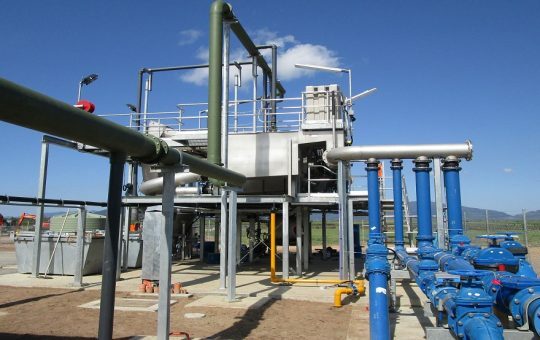 Some of these upgrades included new Safety IO for existing emergency hardware (which involved an 18 hour upgrade whilst the site remained operational) and installation of new valves, as well as capacity for future site upgrades. Both sites are now fully operational, with positive feedback from the client about how well the site is operating. BRS has since been contracted to perform further upgrade works at the 105 Tingira Street Facility. "Julie Bishop takes part in Graincorp's official commissioning celebrations"